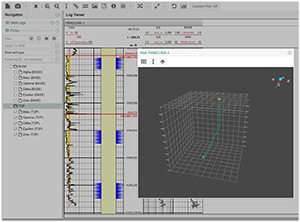 HTML5 Wellbore Tool for PetroTrek® and Quick Value Assessment (QVA®) products. The Information Store (iStore) is a petrotechnical services company that offers comprehensive tools to analyze the abundance of integrated and vital exploration and production data in the oil and gas industry. With nearly 25 years of experience, iStore has grown to possess some of the most advanced web-based data access and visualization technologies available in the industry, customized to fit customers’ evolving needs. Learn more at www.istore.com. iStore developed PetroTrek and QVA web-based tools for managing and analyzing upstream data. Since these tools required high-performance web-based visualization of wellbore data, the tool needed to be able to handle individual or multiple wells, as well as display a variety of downhole data and well log curves. Previous versions of its wellbore tool used Microsoft Silverlight, a plugin technology that has been deprecated. iStore wanted to develop a new version of its wellbore visualization tool that took advantage of the new HTML5 capabilities supported in modern web browsers. At the same time, iStore wanted to have an updated, easy to use and fully interactive user interface. iStore’s PetroTrek and QVA reserves analysis software are both built and configured using web-based technologies. To speed up the development of its new wellbore tool, iStore used INT’s GeoToolkit.JS HTML5-based libraries to avoid starting from scratch. GeoToolkit.JS includes many features specifically designed for handling and displaying well log curves. The library is well documented with extensive examples, which allowed iStore to quickly understand the capabilities of the INT toolkit and significantly reduce the time needed to develop a variety of new wellbore and well log visualization features. With the help of GeoToolkit.JS, iStore was able to develop new wellbore and log visualization tools rapidly, allowing the Company to focus on core functionality rather than the underlying HTML5 technologies. 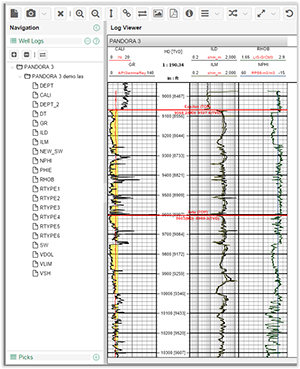 iStore now offers more features, like PDF output, in its improved wellbore tool and plans to incorporate newer ones as INT continues to enhance GeoToolkit with further capabilities such as 3D log display. See how GeoToolkit.JS can help you achieve your objectives with a free 30-day trial.